This article refers to the South Korean private university. For the fourth-generation Japanese American Yonsei Japanese-American, see Japanese American. Hospital established in 1885 by royal support, college installed in 1915. The university was established in January 5, 1957 by merger of two. Yonsei University (IPA: /'jənsɛː/) a private, coeducational university located in Seoul, South Korea, has earned recognition as one of the leading universities in Korea. 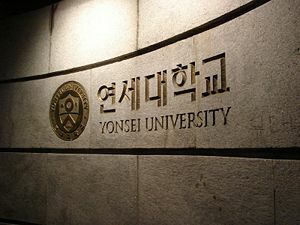 Korean people often express that noting that Yonsei belongs to the "SKY" universities, along with Seoul National University and Korea University in South Korea. The university formally established in January, 1957 through the union of Yonhi College and Severance Union Medical College out of long-lasting bilateral cooperation between the two colleges begun in the 1920s. Yonhi stands as one of the first modern colleges, founded originally as Chosun Christian College in March, 1915, and Severence has its roots in the first modern medical center in Korea, Gwanghyewon, founded in April, 1885 by American Presbyterian missionary Horace N. Allen. 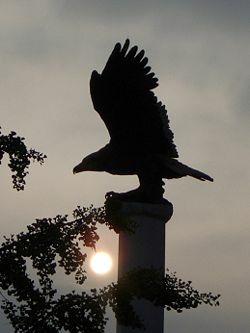 As a tribute, the name 'Yon-sei' derived from the first syllables of the names of its two parent institutions. Yonsei University's roots lay in the arrival of American missionaries to Korea in 1884. Horace Allen, Horace Underwood, Ella and Henry Appenzeller, and Mary Scranton, representing the Presbyterian and Methodist Churches, laid the foundation for Yonsei University, Ewha University, and Paichai University. 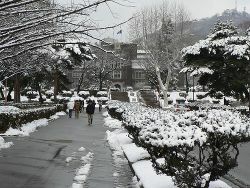 Yonsei University, a private college, recently celebrated it's 120th anniversary. The history of Yonsei provides a cross-section view of the history of Korea since 1884. Rather than a by stander to that history, Yonsei has been an active participant in Korean history, educating generation after generation of Koran leaders. 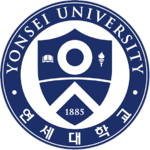 The "ㅇ" and "ㅅ" in the University shield derive from the first letters of "연세"(Yonsei). The circle "ㅇ" represents the ideal of a complete and well-rounded person, while the "ㅅ" symbolizes the upward-looking striving for scholarly excellence. In addition, the "ㅇ" stands for Heaven, the "-" represents the horizon of the Earth, and "ㅅ" signifies "Man" as expressed in the Chinese character (人). The open book stands for Truth, the torchlight signifies Freedom, and the shield protects those two core principles of the University. 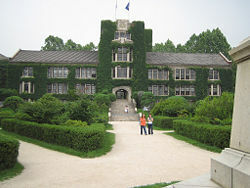 Yonsei University hosts the Korean Language Institute (KLI), reputed as one of the leading Korean language institutes in Korea. Yonsei KLI caters to students studying Korean from all parts of the world with a focus on Korean grammar and writing. Koreans regard Yonsei as one of the top universities in South Korea, belonging to a group of three universities in Korea nicknamed "SKY" schools. Koreans created the acronym from the initial letters of the three "Ivy" universities in Korea: Seoul National University, Korea University, and Yonsei University. 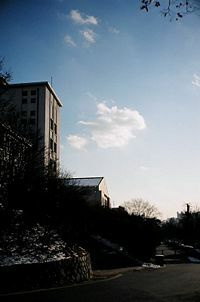 "SKY" alumni have held major positions in diverse fields in Korean society for decades, admission into those three universities considered tantamount to entering high society. That widely accepted view fuels tough competition in high school education in Korea.. The Yonsei University Medical School dates back to April 10, 1885, when Horace Allen established the first modern hospital to practice western medicine in Korea, Gwanghyewon (광혜원 廣惠院, House of Extended Grace). The hospital, founded by Horace Newton Allen, the American protestant missionary appointed to Korea by the Presbyterian Church in the U.S.A (from here on the Church). King Gojong renamed he hospital Jejungwon (제중원 濟衆院, House of Universal Helpfulness) on April 23. The Church appointed Oliver R. Avison to run Jejungwon on July 16, 1893, Dr. Allen having been appointed US Ambassador to Korea years before. Initially, the Royal Palace financed Gwanghyewon while the Church provided the medical staff. By 1894 when the First Sino-Japanese War and Gabo reforms took place, the hospital lost government financial support, the management of Jejungwon now came fully under the Church. In 1899 Avison returned to the United States, attending a conference of missionaries in New York where he elaborated on the medical project in Korea. Louis H. Severence, a businessman and philanthropist from Cleveland, Ohio, in attendance, deeply moved, paid for the major portion of the construction cost of new buildings for the medical facility. The Presbyterian mission in Korea renamed Jejungwon renamed Severance Hospital in his name. Jejungwon (later Severance Hospital) served primarily a hospital but also performed medical education as an attachment. The hospital admitted its first class of 16 medical students selected through examinations in 1886, one year after its establishment. By 1899, Jejungwon Medical School became independently and officially recognized. Following the increase of diversity in missionary denominations in Korea, collaboration began to form. Jejungwon received medical staff, school faculty and financial support from the Union Council of Korean Missionaries (한국연합선교협의회) in 1912, the medical school taking the new name Severance Union Medical College in 1913. Apart from the medial college, the rest of Yonsei University traces its origins to Chosun Christian College (조선기독교대학) founded on March 5, 1915 by another American Protestant missionary sent by the Church, Horace Grant Underwood. Underwood became the first president, and Avison vice president. Located at YMCA, courses began in April of that year with sixty students and eighteen faculty members. Underwood died of illness on October 12, 1916, Avison taking over as president. On August 22, 1910, Japan annexed Korea with the Japan-Korea Annexation Treaty. The first Governor-General of Korea, Terauchi Masatake, introduced Ordinance on Chosun Education (조선교육령) in 1911, and subsequently Regulations on Professional Schools (전문학교 규칙) and Revised Regulations on Private Schools (개정사립학교 규칙) in March, 1915. The Japanese intended the regulations to stifle private education in Korea. Any establishment of schools, any change in school regulations, location, its purpose, coursework or textbooks must receive authorization from the governor-general. Professors must teach all courses in Japanese. Severance Union College struggled to meet those requirements. School regulations and coursework altered, the faculty evaluated and increased, its foundation and its board clarified. Yoni received recognition as a professional medical school on May 14, 1917. In 1922 the governor-general Makoto Saito issued Revised Ordinance on Chosun Education (개정조선교육령) calling for more strict qualification of the faculty. Severance responded obediently, recruited more faculty members with degrees from accredited institutions in North America and Europe. Japan conditionally recognized the competence of the college. In 1923 Severance recovered its right to give medical license to its graduates without state examination, a right lost since 1912. In March, 1934, Japanese Ministry of Education and Culture further recognized Severance by allowing graduates the right to practice medicine anywhere within Japanese sovereignty. Oh Geung Seon (吳兢善) became the first Korean president of Severance in 1934. Ordinances in 1915 and 1922 also affected the fate of Chosun Christian College. 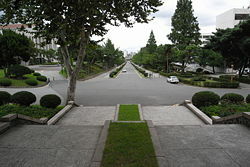 First intended as a college, Japan refused to recognize that legally since the Ordinance (1915) prohibited the establishment of Korean private colleges. Hence Chosun Christian College, renamed Yonhi College, received formal acceptance only as a professional school on April 17, 1917, then a joint project from diverse missionary denominations. Yonhi in reality had formed the organization and faculty becoming a university consisting of six departments: humanities, agriculture, commerce, theology, mathematics & physics, and applied chemistry. The ordinances, furthermore, prohibited coursework in Korean history, its geography, or in Bible outside the department of theology. The Council of Missionaries reacted with A Resolution on the Revised Educational Ordinance (개정교육령에 관한 결의문) carefully pointing out that Japan applied more rigorous standards to Korean universities and schools than to its private schools in mainland Japan. After March First Independence Movement swept the peninsula in 1919, Japan somewhat relaxed its grip on Korea, reflected in the Ordinance (1922). The Governor-General ceased the arbitrary control over the coursework and the qualification of faculty members, altering its stance on strict separation of religion from all education. Japan recognized Yonhi as a professional school equal to its counterparts in Japan, permitting Christian programs and the Bible in its coursework. Japanese literature became mandatory, in turn. Under Japanese intervention, Professors taught Korean history under the name Eastern History and they taught Korean language whenever possible. Yonhi freely admitted non-Christians, encouraging the majority of Christian students to gradually influence and assimilate them. Severance and Yonhi maintained close ties with Independence Movement. Many faculty members and students of Severance and Yonhi directly involved in the March First Independence Movement. Severance continued its contribution by printing The Independence in the basement of one of its buildings, Yonhi actively supporting the cause of independence. By the end of the Independence Movement, only seventeen students remained in the college. Yonhi students actively participated in the Chosun Student Council for Scientific Research (조선학생과학연구회), one of the leading groups in the Mansei movement of June 10, 1926. Yonhi Student Council and many faculty members, belonging to the clandestine Shin Gan Society (신간회 新幹會), gave full support to the Gwangju Student Movement. In the aftermath, Japanese police apprehended students, exposing the Shin Gan Society. Later, students actively participated in V Narod (브나로드) and Student Enlightenment Movement (학생계몽운동) during 1929-1930. In the late 1930s, Japan again shifted its policy towards Korea to incorporate it to its scheme of expansionism. In August, 1936, the new Japanese Governor-General Jirō Minami began the assimilation of Koreans, to force them to serve the Japanese military. The Governor-General enforced Sōshi-kaimei and Shintoism on Koreans, while recruiting Koreans for Japanese war efforts. In April 1938, the third Ordinance on Chosun Education ordered the acceptance of Shintoism, voluntary removal of Korean language in coursework, and further intensification of Japanese and Japanese history education. Yonhi Professional School refused to cooperate, opening courses on the study of Korean language in November, 1938. Japan reacted in March, 1940, forcing Yonhi to open courses on Japanese studies for each department and each grade level. From 1938, the Japanese restricted the teaching of English following a deterioration of relations between Japan and United States. The Governor General forbade coursework in English while censoring texts of English writers. In 1938, President H.H. Underwood accepted the practice of Shintoism to avoid the fate of Yonhi's termination. Governors-General pushed Yonhi to refuse financial support from United States and financial difficulties amounted. On individual level, Japanese police apprehended or interrogated Yonhi faculty members and its students during this period for their involvement in real and alleged resistance movements. In 1939, the United States government recalled all its citizens and missionaries in Korea. Underwood and some of the faculty refused to leave Korea until forced to in 1941-1942 following the outbreak of the pacific war. The Japanese dispatched military officers to Yonhi for military training of students in 1940, while drafting for forced labor began in 1941. The Japanese seized scientific equipment, building materials, and even the Underwood's statue, turning the campus yard into drill ground. On August 17, 1942, the Governor General dismissed the board, appropriating Yonhi property as property of the enemy United States. The Governor-General named an appointee to directly manage Yoni, converting the campus into a tool for assimilation of Koreans into the Japanese military and drafting forced labor. By October, 1943, the Japanese conscripted the students, converting dormitories into barracks while housing the Japanese air force in 1944. Finally, on May 10, 1944, Governors-General closed Yonhi, redesignating the college Kyungsung Industrial Management School (경성공업경영학교), with the primary purpose of training engineers for Japan's war effort. Due to their value in the time of war, medical students of Severance escaped "voluntary recruitment," but Severance also faced Sōshi-kaimei, military training, and constant surveillance by the Japanese authorities. The Japanese coerced Severance coerced into changing its name to Asahi(旭) in 1942. The liberated Korean government approved Severance as a college in 1947. Since the Japanese had run the majority of medical institutions in Korea, a shortage of medical staff and faculty plagued the hospitals after the Japanese departure. Many members of Severance staff and faculty left Severance to assist other institutions. Severance also took up the role of student leadership, outspoken against Division of Korea. In 1950, during the outbreak of the Korean War, Severance functioned as a field hospital until North Korea overran Seoul. Most the Severance community fled in time, but some faculty members and students, unable to escape, stayed behind. The invading North Koreans killed and captured them. Severance seniors joined the military as army surgeons. Although Severance returned to Seoul for a while after its recapture, the community fled again in December on a LST in Incheon. When Severance arrived in Busan, its medical school joined the wartime college, a temporary body. Meanwhile, the Severance facility in Seoul, located in the center of the city near the Seoul station, received heavy damage. Severance Hospital again returned on April 1, 1952, while the medical college followed on June 12, 1952. The United States military command, initially neglecting the restitution Yonhi, planned to utilize it as a military hospital or judiciary training center. The United States command changed to view Yoni as a missionary college that had been dispossessed by the Japanese Governor-General. Yonhi opened its doors again on January 21, 1946 and, on August 15, 1946, won recognition as a university. Baek Nak Jun became president. A period of transition, Yonhi University faced numerous obstacles including financial ones. After 1947, financial affairs became more stable and the programs settled. At the time, Korea lacked teachers, the provisional government requested Yonhi to provide education and training. They established Temporary Training Center for Secondary School Teachers in Mathematics, Physics and Chemistry (임시 수물화학과 중등교원양성소). In December, 1948, plans for unification of Yonhi and Severance began to take form. Yonsei Graduate School had formed in July 1950, one month after the outbreak of the Korean War. Normal operations came to a halt with the outbreak of the Korean War. The university suspended all courses on June 27, two days after the North Koreans launched a surprise invasion across the 38th parallel, recruiting student soldiers. The North Korean military advanced into Yonhi campus, establishing its headquarters there. During the retaking of Seoul following the Inchon landing in September, fighting severely damaged the campus. The university reopened following the recapture of Seoul, but once more fled to Busan in December with the Chinese invasion. In February 1951, Yonhi joined the wartime college while keeping an independent governing body, opening its own courses on October 3, 1951. On April 15, 1953 Yonhi began its work on restoration, Yonhi returning to its campus in the fall. In 1957, Severance Medical College and Hospital and Yonhi University merged to form Yonsei University. Today, Yonsei operates its main campus in Seoul and a satellite campus in Wonju, Gangwon Province. Kim Woo-jung: Former founder and CEO of Daewoo Corp.
↑ James Card, Life and Death Exams in Korea, Asia Times, November 30, 2005. Retrieved August 31, 2015. ↑ History written above clearly suggests that Severance Hospital and College of Medicine originated from Jejungwon (Gwanghyewon). Recently Seoul National University Hospital claimed a historically link to Jejungwon(Gwanghyewon). Medical historians criticized the statement as without supporting evidence. ↑ Department of theology failed to open due to the disputes among the founding denominations. ↑ Educators in Korea commonly considered the Ordinance (1922) to have an ulterior political motives, not as genuine effort to improve education. 동아일보사설 Donga Daily Editorial, February 10, 1922. ↑ Faculty members including Choi Hyun Bae, Lee Yun Jae, Jung In Seo, Yu Eok Kyum, and Baek Nak Jun contributed to that outcome. ↑ That originally included Ewha University. Ewha University opted out, asserting its independent goal as education of women. Underwood, Horace H. Modern Education in Korea. International Press, 1926. in English ASIN: B00086Q2KS. All links retrieved August 31, 2015.